EDITORIAL – Why clutter up McArthur Island park with flying frisbees? LOOKS VERY MUCH like McArthur Island will be getting a combined nature park and disc golf course. We’re talking, of course, about the former mini-golf property at the tip of the island. It seems a strange decision. City staff looked at a number of other multi-use parks in the province that include disc golf. One of them, in Langley, is being built on a reclaimed landfill. Another, Quilchena Park in Vancouver, is described by that City as “welcoming to sports enthusiasts” and is located near a secondary school, hbousing, a Starbucks and shopping. It has a history of rude exchanges between disc golfers and dog walkers, though in fairness it should be noted that it’s unlikely dogs will be allowed in McArthur Island Park. There’s nothing quite like McArthur Island, though. It’s a secluded gem away from urban activity, frequented by a variety of wildlife. Perfect for a passive nature park. Why the Parks Department is so focused on bringing disc golf into the picture is hard to figure. The report to council notes there are three other possible locations. Why clutter up the McArthur Island property with flying frisbees? Unfortunately, the Kamloops Naturalists Club, the key proponent of a passive nature park, is pretty much throwing in the towel. It now suggests the disc golfers should be limited to nine holes instead of 18. That won’t solve anything. The best answer remains putting the disc golfers somewhere else. 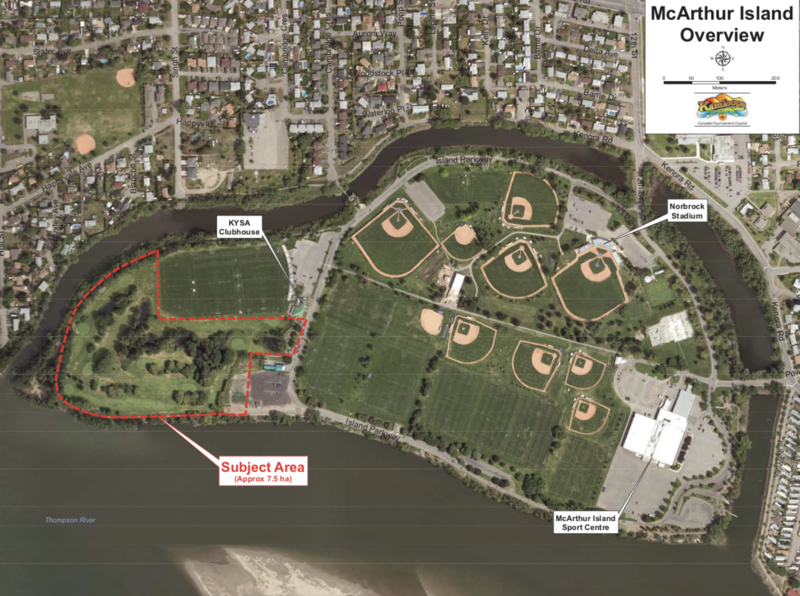 8 Comments on EDITORIAL – Why clutter up McArthur Island park with flying frisbees? This is a great location for disc golf since it was a golf course. Disc golf will also allow the area to go back to its natural state. It’s a win win allowing people and nature to use the space together. If you want to see real nature just go for a hike anywhere around Kamloops. It’s all around you and so accessible. This seems like its a debate around old school thoughts (nature park) and the younger generation needs (disc golf). I applaud the recomendation to council for thinking about the needs of younger persons of this community. We want to encourage our youth of today and the future to get out and play. A perfect opportunity to leave the place as nature intended, what a glorious park to have smack dab in the midst of the city. Pulling my taxpayer’s hat firmly on, my understanding is that the proposed compromise in creating an 18 hole disc golf course, with some crumbs for nature (turtle pond and such). will cost something like a million bucks. My understanding is that the Naturalist Club proposal for a passive natural area would cost very little. There would be next to no expenditure in allowing much of the land to revert to natural values. The naturalists have said that they would raise the money themselves for any future enhancements. Knowing the depth of funding available from granting agencies, and possibly assistance from the BC Nature Foundations, I say, firmly clutching me wallet, let them do that. How refreshing for a fine proposal to be other than on the public dime. Make it all natural and celebrate something different from the usual handout expectations. On taxes, especially on taxes with a 100% local burden I fully concur with your fine commentary, Frank. What a joke, the city has been strong arming this decision and promised this land to the disc golf association despite the 9 plus groups and public’s input stating that they want the park left alone. The city is working for the people and therefore need to listen to the people not just one small group. Disc golfers already have a course. It is a stupid idea. I don’t know why Council bothers getting public feedback as they don’t listen. Respecting the future use of the ex-golf course property on McArthur Park, I am imploring council to reject the Department recommendation for a compromise solution allowing for an 18-hole disc golf course and some preservation of natural values at McArthur Park. This compromise cannot provide a true nature experience in the park. Like many attempts to please competing interests, it winds up not serving either well. The Kamloops Naturalist Club has only recently secured a very large Lawson Youth Foundation grant to help train the next generation of naturalists. What an opportunity to create a unique collaboration between KNC, TRU, the School District, the City and the many who deeply appreciate nature in our city. I urge our civic leaders to consider something truly innovative and imaginative, something that will pay off for future generations and one that could well attract international attention and regard. Leadership sometimes means going against the grain. I just wonder what visitors’ frequency the existing disk golf up Rose hill has. Is that pastime really that popular? But maybe a nine-holes on the portion closer to the road, as a buffer to the rest of the nature area as a compromise? Typically council moves with staff but hopefully the rogue member on council give this a thorough debate.